I have been playing Forza Horizon 2 for a few months now and I don’t think I am even half way through everything there is to do in the game; yet Playground Games is ready to drop a whole new metric ton of extra stuff on us in the new “Storm Island” expansion pack. Storm Island is a “mysterious island somewhere off the coast of Italy” where players can participate in 80 new events in new environments including trails where the sky is darkened by volcanic ash in new off road cars like rally cars and super stadium trucks. Check out the trailer below to see more. If you want the Storm Island expansion it comes out tomorrow (Dec. 16th 2014) for $19.99. If you are a Forza VIP member then you can get the expansion for $9.99. UPDATE: Scroll below the video for the official press release which lists new events, and the new cars that come with the expansion pack. Storm clouds are gathering; a fierce tropical storm is about to break. Several of the world’s most iconic off-roaders are lined up, poised to spring with a punch of the gas pedal. Thunder crashes in the distance, an omen of the dangerous terrain and extreme elevation changes that await. Drivers grip their steering wheels, ready to tackle the epic challenges ahead. Welcome to a new land of extremes with the “Forza Horizon 2: Storm Island” expansion! The Storm Island expansion brings fans more of what they love about the year’s best racing game: more beauty, more fun, more challenge, and more ways to compete with and against friends. The “Forza Horizon 2: Storm Island” expansion is available now exclusively on Xbox One and can be purchased from the Xbox Live Store for $20. “Forza Horizon 2” VIP owners will receive a 50 percent discount on the expansion, making the price just $10 for VIP members. This expansion pack for “Forza Horizon 2” features a new location to explore, the mysterious and foreboding Storm Island. This is a land of gorgeous variety and monumental challenge, with sudden and dramatic terrain changes that push players and their cars to the limit. Storm Island also features the most severe weather conditions ever seen in a “Forza” game, including fierce tropical storms and thick fog that will add an entirely new level of challenge. On Storm Island, the weather and the world combine to present players with extreme adventure every time they get behind the wheel. Storm Island has been built with the “Forza Horizon 2” engine and infused with brand new technology that showcases the beauty of the world. New features like swaying trees in extreme windstorms and the rays of the sun cutting through thick fog bring the adventure and splendor of Storm Island to life in ways players have never experienced before. 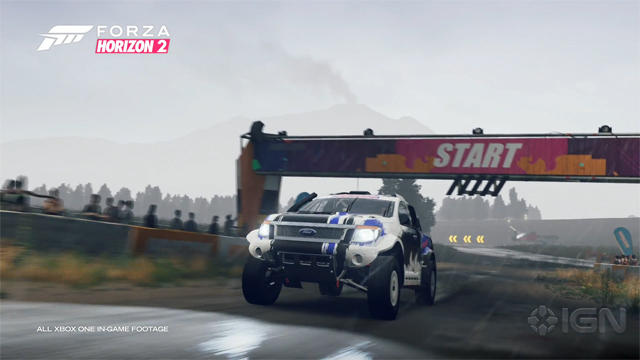 Fans have played Cross Country events in “Forza Horizon 2” but have never played them quite like this. With more extreme elevation changes, a variety of different terrain types, and strong storms to contend with, Storm Island’s Extreme Cross Country races are not for the faint of heart. Storm Island is a massive expansion of “Forza Horizon 2,” with tons of content and replay value. In addition to new event types listed above, Storm Island will include new items and locations to explore – including new roads and bonus boards, a brand new Car Meet, new Bucket List challenges, new speed trap and speed zone leaderboards, and additional Rivals events. The pack will also include five new iconic cars and trucks (see below for full descriptions of the five cars in the pack), plus a new barn find car (which we’re keeping secret for now). For players who enjoy upgrading their vehicles, we’ve also got new off-road suspension, tire, and transmission upgrades that can be applied to any of “Forza Horizon 2’s” 200+ cars. In addition, we’ve also added new rally-inspired body kit upgrades for a select number of legendary cars in game. All of this amazing content, plus 23 new Xbox Live achievements (adding up to 500 gamerscore points to your total) makes the “Forza Horizon 2: Storm Island” expansion an amazing value for “Forza” fans. For more on the “Forza Horizon 2: Storm Island” expansion, check out the livestream on the official “Forza Motorsport” Twitch channel, which will be beginning at 11 a.m. PT on Tuesday, Dec. 16.